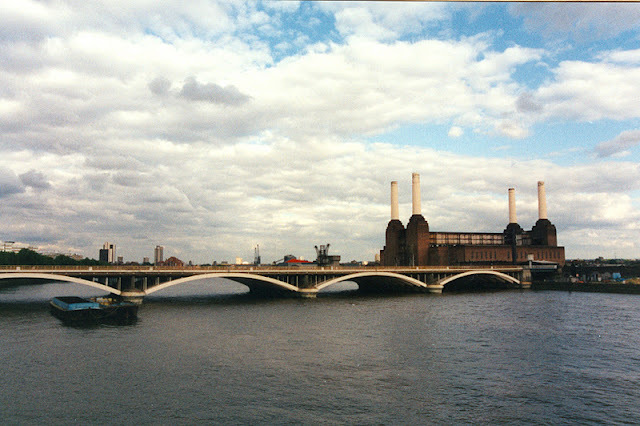 The next arch structure downstream from Battersea Bridge is the Grosvenor Railway Bridge. It is now three bridges as more tracks were gradually added. The bridges were constructed from 1858 to 1866. They were substantially rebuilt using new, steel members in the 1960's. Today the bridges are 284 m (832 ft) long, 54 m (177 ft) wide, and with the longest span being 53 m (175 ft). Trains on the Southern Railway line from Brighton to Victoria took 50 minutes in the 1950's. Today, due to increased congestion, the trip takes much longer. The bridge is just west of the Battersea Power Plant. Thames River Bridges: Grosvenor Bridge by Mark Yashinsky is licensed under a Creative Commons Attribution-NonCommercial-ShareAlike 3.0 United States License.